Digi-Key Electronics, an Eclipse customer of three years, is undergoing a major growth spurt. Digi-Key is one of the fastest growing distributors of electronic components in the world. They are a privately held, global company, with revenue of more than $2 billion. They are in the process of building a new warehouse and processing center – adding 2.2 million square feet and 140 new jobs in 2017 alone. Because of the company’s expected growth, they demand DocOrigin to be able to produce 23,000 documents per hour. Another great example of DocOrigin as a mission-critical form, document and label software solution. Eclipse was named one of the 10 Foremost Enterprise Document Management Solution Providers in the 2018 issue of Mirror Review. In today’s fast-paced world, people wake up in the morning and ask Google Voice for the weather forecast before they even get out of bed. Running on parallel lines, the document world is seeing similar leaps made available through the use of tablets and smart phones to read documents, complete forms and even order food from McDonalds, etc. The increase in usability, convenience, control and the transformation from paper to digital is all about customer and user experiences. Many legacy form software products are obsolete or sunset; they simply can’t provide the form presentation and delivery methods required by customers, partners and employees! Omni-channel delivery made available in products like our DocOrigin is helping companies bridge the transition of technology to deliver documents when you want them, where you want them, in real time with key information that is relevant to you. Isn’t it time you move to a solution that meets your needs now and in the future? DocOrigin improves communications with customers, partners and employees. Its Business Communications Center (BCC) solution, powered by DocOrigin, is managed by marketing, HR or customer service teams while compliance-related control can be managed by legal and IT teams. With BCC™, the design and delivery of transactional documents that serve as a vehicle for custom marketing and messaging are put in the hands of the stakeholders within the business. All this can be done without scripting or modifying clients’ line of business software. Moreover, its license model allows users to replace their existing forms and documents one at a time or through a complete replacement. Read the full article here. Eclipse Corporation, a leading provider of enterprise document design, presentation, generation and customer communication management software announced that its flagship product, DocOrigin has been enhanced to drive Zebra printers at rated speeds when used in a single facility installation or globally distributed printing environments. DocOrigin’s production software allows customers to drive an unlimited number of printers locally or globally. 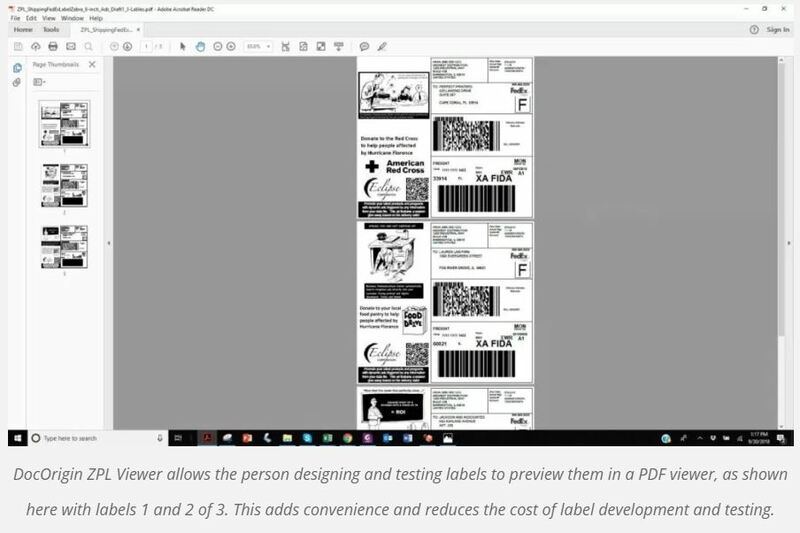 DocOrigin ZPL Viewer allows the person designing and testing labels to preview them in a PDF viewer. This adds convenience and reduces expenses by allowing the developer to test multiple labels to confirm fidelity without using up ribbon and label stock. ZPL Viewer makes QA and Test a snap! You can view a single label or hundreds, seriously reducing ribbon and label waste. DocOrigin drives hundreds or thousands of powerful Zebra printers at full speed, meeting all mission-critical business demands. Up-sell and cross-sell with labels using targeted messaging. Add safety messages or advertising next to FedEx, UPS, USPS labels based on relevant products being shipped! Integration Without Modification™, Eclipse’s methodology, gives customers the ability to design and produce dynamic, data-driven labels without customization of their line-of-business software and eliminates the need for change orders or custom programming. Scalable pricing provides SMBs the same features and performance provided to our Fortune 10 customers, at an affordable price. LaserBand® Wristband form templates are provided to healthcare customers. Support for Zebra Browser Print: Simplifies monitoring USB connected printers, provides the ability to perform real-time status checking and reporting and allows cloud-based applications to print to any USB connected Zebra printer. Did you miss the Eclipse-hosted Xplor Webinar from September 5th? Go ahead, Bookmark our blog and drop by the 2nd and 4th Tuesday of every month for great new content!